Now charge all the iPod devices without worrying about knots and tangles with the convenient 6ft long cable. 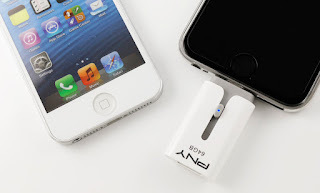 It can easily connect and charge iPhone, iPad or iPod devices’ battery life or sync with ITunes media library. The PNY Lightning Charge and Sync Cable is 6 ft in length (twice the length of standard OEM cables) and has two connectors, a Lightning compatible connector, and a standard USB 2.0 connector for simple syncing connectivity. Simply plug the device into any wall charger adapter, power bank or computer USB port for easy charging compatibility. Constructed with the highest quality materials, the ultra-light weight and flexible cord lets it carry this cable whenever anyone are on the go. It supports any standard USB port on your PC, laptop or charging adapter. The 6ft Lightning Charge and Sync Cable ensures a quick and efficient charge and provides the extra juice for the precious mobile devices. The PNY 6ft Apple Charge and Sync Cable is available in white colour cable and is backed with a warranty of 1 year from the date of purchase. Epson recently updated its Full HD projector range with the EH-TW5350. In addition to improved brightness and contrast ratio specifications, the EH-TW5350 is the first entry-level full–HD projector in Epson’s range to introduce several advanced features that used to be found only in Epson’s high-end home theatre models. These include frame interpolation, image enhancement and 2D to 3D conversion. 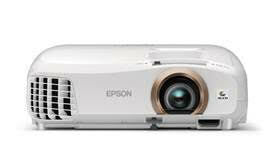 The EH-TW5350 also has class-leading 3D projection features that have made Epson renowned for its 3D image quality. These include its 3LCD technology and an active, 480Hz 3D drive system that is twice as fast as competitors – together, these render 3D images with high colour brightness. It also employs an active 3D glasses system that uses Bluetooth instead of infrared signals to synchronise the 3D frames being projected with the blackout phases of the active 3D glasses. With Bluetooth, there is no line of sight needed for synchronization of the signals, and they will not be subject to any infrared interference from the remote control. View Sonic has released for the public three specially designed apps to make the use of projectors that much simpler. 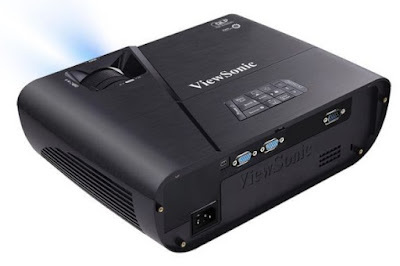 To provide consumers with the most abundant and convenient portable projector information check tool, ViewSonic integrates high degree of flexibility and integration capabilities, and 100% self-develop three designed projector APP, including the world's pioneer ProjectorExpert APP which gathers multiple function and diverse information, vRemote remote control APP, and ProjectorDistance APP, assisting consumers any problems might be concurred when selecting projectors, such as how to choose appropriate projector from all selections, whether to meet future projection space, or any similar case study information can be referred to in advance. The ProjectorExpert App is a world pioneer app that collects diverse information and provides multiple functions. The app has menu options for DLP, Features, Projector, ViewSync, Accessories, Successful Story, Distance Calculator, Press Releases, Select A Projector and About. These ten options create a space to review projector related information and acts as a general users perfect assistant tool to carefully know all the details about a projector. It can also be useful for professionals who are sellers or distributors of projector systems. It is easy and intuitive to utilize and provides a well needed tool to check issues instantly. For example the “Features” option can check the power setting of the projector, its lamp mode, the color options, the presentation timer and over 30 odd different features. The “Projector” mode can check the screen resolution, its brightness, the throw of the projector light and its usage in a home theatre, for commercial uses or educational purposes. Whereas the “Select A Projector” menu cycle through a range of projector features such as lamp type and wattage, resolution and brightness in lumens to enable the user to choose an appropriate projector for their requirements. The vRemote App causes the users smartphone to function as a virtual remote control. In order for it to function the smartphone must be Infrared enabled or users can utilize a USB wireless adapter (PJ-WPD-200) to have their Android™ or iOS devices wirelessly stream content to a projector. In addition, vRemote can instantly help users automatically correct keystone with a simple snapshot of the projected image. Administrators can also remotely view the projectors’ lamp working hours and adjust keystone. The vRemote app is also capable of turning the projector on and off, changing the aspect ratio and adjusting the color mode, volume and keystone among twelve different options. The ProjectorDistance App is a useful tool to find out if the user’s projector will fit the available room space. This works whether the area is a small meeting room, medium sized classroom or a large hall. This can be done in two easy steps, simply choose the projector model then measure the throw distance. Options will then display as to the correct screen size and projector placement. These apps from ViewSonic offer a wide range of functional services to get the user convenient portable projector informational tools. They can check a variety of settings connected to the projector, select appropriate projectors for different situations and review many projector related issues and problems. The ViewSonic Projector apps provide a high level of flexibility and integrate well between the user’s mobile device and the selected projector. All the apps are made available on the Google Play and App store for Android and Apple iOS devices. 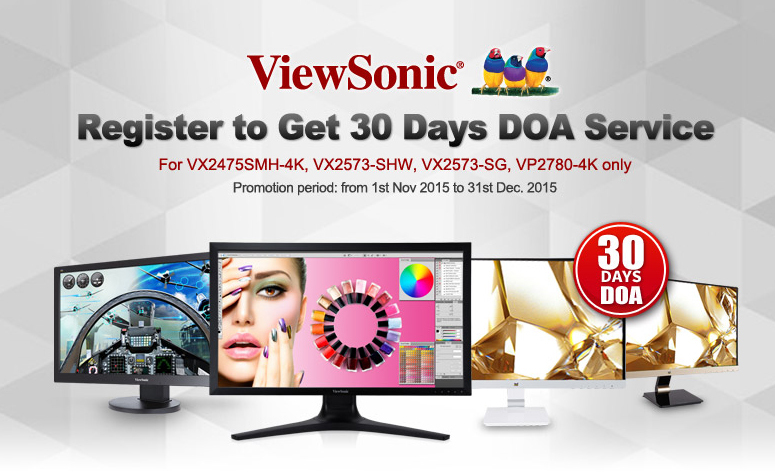 ViewSonic announces to provide free 30-day Dead-On-Arrival (DOA) service from 1st November to 31st December, 2015, for the selected range of Ultra HD monitors, including VX2475SMH-4K, VX2573-SHW, VX2573-sg, and VP2780-4K. ViewSonic has been devoted to providing customers in India with high-performance products and guaranteed excellent service. Consumers can now apply for this special service by registering their newly-purchased ViewSonic products online at the official website http://ap.viewsonic.com/in/register. Register now and obtain the free warranty service! The 30-day DOA Service Policy is valid only for customers in India. 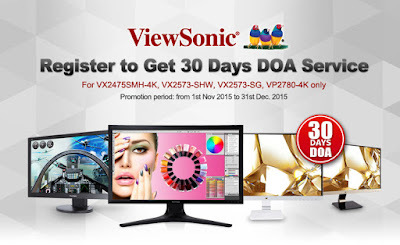 To apply for this free 30-day DOA service, consumers must first register on ViewSonic website, and call the ViewSonic India toll free customer service hotline, 1800-419-0959 or 120-612-1200. The original purchasing invoice or receipt must be kept as proof of purchase; purchase date, name & address, serial number of the product, and detailed description of the problem have to be provided to complete the application process. Viewsonic’s pick-up service will then arrive on site to verify the situation, and the complete package of product (with all original accessories included) shall be collected along with the original invoice copy. Within few days, ViewSonic will offer a full replacement for the returned product. the projector automatically enters a 3-minute standby mode when it is idle and turns down the projection to a power-saving 30% brightness. You can quickly reactivate the projector with a remote for continued use and resume screening your presentation or video. The projector also features a convenient Auto power on and off mode that automatically powers on when a VGA or HDMI cable is connected and powers off when no signal is detected for a period of time. Now you can quickly access your favourite features with "My Button" shortcut feature that can launch any desired function with a simple press of the button. You don’t have to scroll through the onscreen menu to search for programs, just click “My Button” to get started with your presentation.Viewing experience is enhanced with five color modes that users can choose the best one to suit their material. Tactile Keypads provides ease of use with raised and concave buttons, plus a central reference button. These assist in making set up easier in dark environments or if the projector is ceiling mounted. Packed with all these amazing features, the PJD5151 LightStream projector is the ideal choice for a school or business that needs a bright and solid projector that displays impressive image quality at a modest price. Intel Corporation today announced several advancements to its Intel® Scalable System Framework (Intel® SSF) that promise to bring high performance computing (HPC) capabilities and benefits to more industries and new workloads. As a foundational element of the Intel SSF, Intel introduced the Intel® Omni-Path Architecture (Intel® OPA), a new HPC-optimized fabric technology that makes the performance of HPC clusters more accessible to a broader variety of users. Once reserved only for governments and academia to solve the most complex computational problems, like genome sequencing and climate research, HPC is transforming more industries with new workloads such as big data analytics. More and more, traditional sectors, like healthcare and financial services, are demanding supercomputer-like capabilities to gain real-time insights from increasingly large and complex data sets. As Intel innovations expand HPC capabilities and lower the barriers to adoption, it predicts HPC will become mainstream. Intel SSF is an advanced architectural approach designed to enable more scalable, flexible and balanced HPC systems. Intel SSF will help to simplify the procurement, deployment and management of HPC systems, broadening the accessibility of HPC to more industries and workloads such as data-driven analytics, visualization and machine learning. The Intel SSF architecture helps run these divergent workloads that stress different parts of the system – compute, memory, I/O – by enabling innovations that optimize the performance of a variety of workloads to be managed in a consistent way. Intel SSF also provides a consistent platform for HPC system deployments in cloud environments. SanDisk Corporation announced the launch of its stylish SanDisk Ultra Flair USB 3.0 Flash Drive, a new addition to its portfolio of high-speed USB 3.0 flash drives. The sleek SanDisk Ultra Flair USB 3.0 Flash Drive comes in a sophisticated and durable aluminum metal casing, which protects against everyday wear and tear and is available in capacities ranging from 16GB – 128GB.. The SanDisk Ultra Flair USB 3.0 Flash Drive is ultra-fast, offering read speed of up to 150MB/s1. With this new USB 3.0, users can spend less time waiting to transfer files -- , the SanDisk Ultra Flair USB 3.0 Flash Drive can transfer a full-length movie in less than 30 seconds2 and transfer hi-resolution photos and videos 15 times faster than standard USB 2.0 drives1 -- making the drive ideal for carrying video and photo collections. “As an industry leader in the flash storage space, SanDisk’s goal has always been to continuously reinvent and deliver reliable products.The SanDisk Ultra Flair USB 3.0 Flash Drive has been designed to provide a storage solution for enthusiasts who need high-speed and stylish drives to quickly transfer their high-resolution photos, videos and other big files without any hassle. Our complete USB range helps consumers enjoy a smart digital lifestyle, anytime, anywhere,” said Mark Eng, Country Manager, SanDisk Singapore. The drive features SanDisk SecureAccess™ software3 to keep private files safe with password protection and 128-bit encryption, and includes a year’s subscription to RescuePRO® software4 to recover lost or corrupted files. PNY Technologies released the special & limited edition of 128GB in HP v220w. It offers an easy and extremely convenient way to transfer share and store. The HP v220w offer intelligent storage in the sleek metallic with classic silver colour. 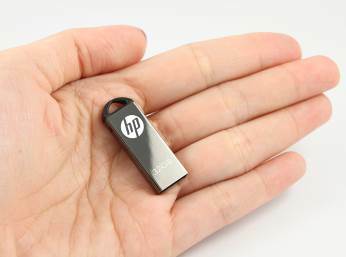 HP v220w features a generous storage capacity of 128GB, so you can comfortably share and transfer your favourite images, music, videos, movies or office documents on this HP USB flash drive. Whether you want to grab and move with your digital files, the HP v220w is the best solution for any outdoor ventures, it has ample storage space to ensure all your files stored in a safe and secure manner and may never have to worry about running out of memory space, thanks to the massive 128 GB storage space. It has a high-quality durable metallic casing with silver and a sleek streamlined appearance with dust and water-resistant, the sturdy build of the drive makes it apt for people who are constantly on the go.Despite its durability, the HP v220w is light and portable enough to be carried around. It weighs in at 4.5 g and measures at H 4.5mm x W 12.2mm x L 34.6mm. The cap less design makes it convenient enough to be carried around without worrying about a misplaced cap. For added portability, it comes with an integrated strap hole that can be looped around and attached to lanyards, key chains, mobile straps or wallets. Easy plug and play operation makes it easier to transfer and share files. Simply transfer files to your drive plug the flash drive into your computer's USB port and drag the desired files into the drive's folder. No additional software or drivers are required, so you can begin transferring and backing up your files immediately. The drive also offers storage capacities ranging from 8GB to 128GB to suit your personal storage needs. It works smoothly with operating systems like Windows 2000/ XP/ Vista/7, 8 and Mac OS: 10.3 and above. The HP v220w is an affordable yet productive solution for preserving and protecting your data and is backed with a limited warranty of two years within the date of purchase. The gaming community can unwrap an early holiday gift with the official launch of the Alienware Steam Machine. Marking an innovative collaboration between Alienware, a pioneer in specialty high-performance PC gaming systems, and Valve Software, the developer of the world’s largest online gaming platform, the Alienware Steam Machine is a customized gaming solution that extends a traditional PC gaming environment into a console-like experience for virtually any room. With the ease of a console and the freedom of a PC, the Alienware Steam Machine combines Alienware’s acclaimed design innovation, reliability and performance with Valve’s SteamOS, one of the most immense game libraries and gamer communities on the planet. Enjoy access to more than 1,500 SteamOS games plus thousands more via in home streaming and over 100 million users to play with. Along with free access (no subscription costs) to this enormous library of inexpensive and free-to-play games, the SteamOS ecosystem is an established pipeline for games yet to come. For your game collection today and into the future, cross-platform support and backward and forward catalog support are hallmarks of the Steam ecosystem, making the Alienware Steam Machine much more than just a console. The Alienware Steam Machine delivers the ultimate living room gaming environment, allowing players to kick back on the sofa with just a controller – no keyboard or mouse required. The base model starts at $449.99 with a Dual Core processor, High Performance NVIDIA GTX graphics and a 500 GB Hard Drive. Upgraded versions include Quad-Core processors, up to 2TB Hard Drive1 capacity and 8GB of memory.2 All models come bundled with the revolutionary new Steam Gamepad. ViewSonic, a leading global provider of computing, consumer electronics and communications solution has announced the partnership with Savera marketing, one of the leading IT Distributor of India, under this partnership Savera will distribute the ViewSonic monitors and will be able to leverage the reach in delivering the monitors throughout India. ViewSonic wants to their base strong in India market, so appointing Savera marketing and with their vast distribution network, both companies will have an opportunity to increase their volumes significantly in the market. Savera Marketing believes in mutually beneficial partnership and with its vast distribution network will contribute in pushing ViewSonic Monitors in the market. It will also be responsible to educate the retailers and dealers about the product and how to generate the sales. ViewSonic and Savera Marketing are planning to carry joint promotion programs by offering various schemes, ViewSonic is offering high specification products with competitive price and is confident that it satisfies service policy for ultimate experience by user. The time has come to celebrate the favourite festival, “the festival of Lights, Deepavali”. Spiritually signifies the victory of light over darkness, knowledge over ignorance, good over evil, and hope over despair. So this year PNY wishing its Facebook fan to celebrate this year Diwali by gifting their dear and nears one with the perfect PNY Diwali Giveaway, and just like any other years, the excitement is on the air with people already bursting the crackers, shopping and exchanging sweets. 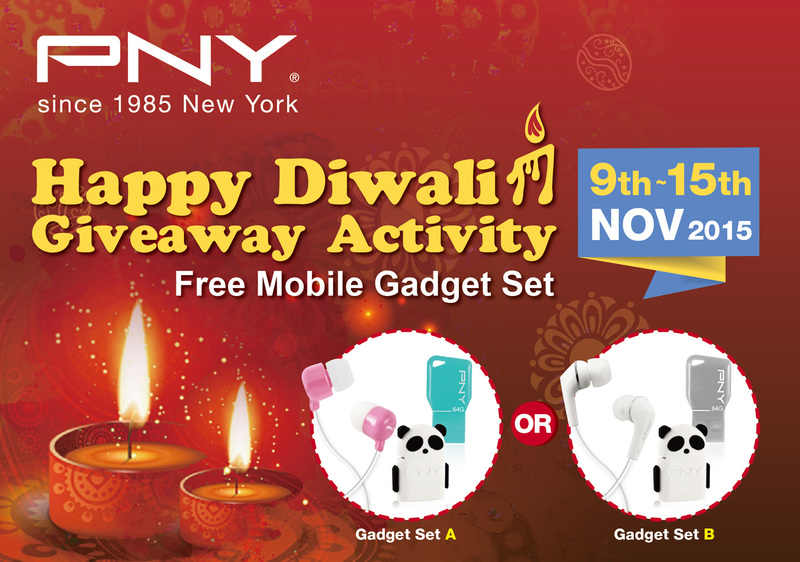 As it is a perfect time to convey warm wishes to your friends, family, acquaintances colleagues and loved ones.For this year Diwali celebration PNY will be giving away the perfect Mobile gadget 2 Set. Each set consist of Key Attaché + OTG Panda and Mic Plus m305p, Set A has the Blue Key Attaché and set B has the Grey Key Attaché. The memorial part of this year Diwali festival is wishing loves ones with the message of love and gifting them with the PNY Mobile gadget set. PNY Key Attaché USB flash drive combines innovation with unsurpassed functionality to offer the next level in storage devices. It effectively serves the dual purpose of being a trendy and fashionable key ring while offering mobility of data and information, the unique and eye catching design makes it a visual delight that complements and reflects the style and personality of the users. And the PNY OTG Panda is a cute little device shaped like an adorable panda replete with details including black eyes, nose, ears, bellybutton, and arms on a snow-white body. The micro-USB port can be connected to your Android Smartphone/tablet, while any USB 2.0 compatible peripheral can be plugged into the other end to work with your Android device. Its tiny size and light weight makes it very portable and the final set of PNY Mic Plus m305p/m105w is ergonomic design and superb breakthrough technology delivers clean, crisp sound providing quality listening, added to that, the selection of soft ear buds that come in three replaceable sizes to suit different ear shapes and provide maximum comfort, it is compatible with IPods, IPhones, MP3s and other computer devices and ensures superior sound is travelled to the ear for dynamic quality. 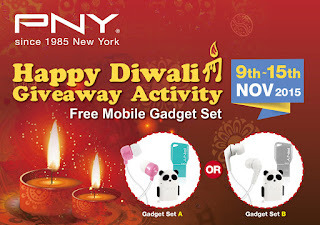 So this Year to celebrate the festival of light PNY wishing all its Facebook fan a Happy Diwali and to win the perfect Diwali Giveaway “PNY Mobile Gadget Set”. “_____ (tag Your friend’s FB ID), let’s Celebrate Diwali with PNY!”. PNY Diwali Giveaway starts from 9th November till 15th November, so hurry, take part and get the chance to win the perfect Diwali gift from PNY. *PNY has the right to disqualify a winner if: winner is found cheating / winner is not a citizen or not residing in India today / winner is not a fan of PNY Technologies India Facebook Page / contact information incomplete, unclear, or incorrect / winner couldn't be reached due to Privacy Settings in Facebook.